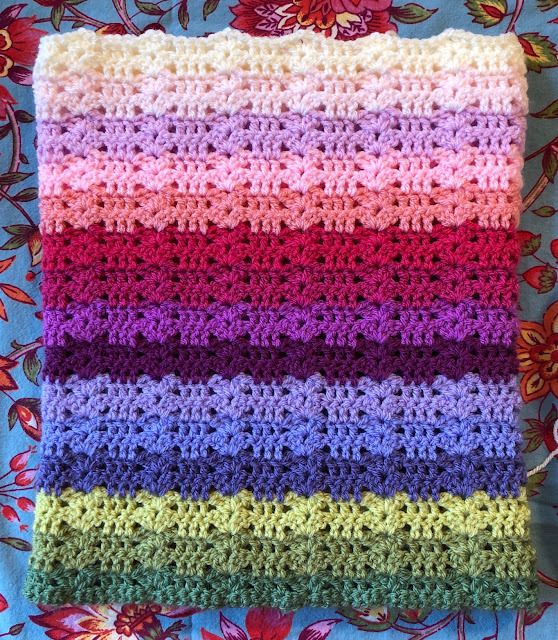 I've used all 15 colors of the Sweet Pea blanket project. I started with the green of the leaves and vines, then tried to go blues/purples and then to the warmer colors and end up with the lights as I reached the top. I'm liking it but I may not use the dark purple between the blues and the violets/magentas. Some of the people doing this CAL are doing a similar colorway then doing a mirror above this, whereas I am going to begin with the green atop this. 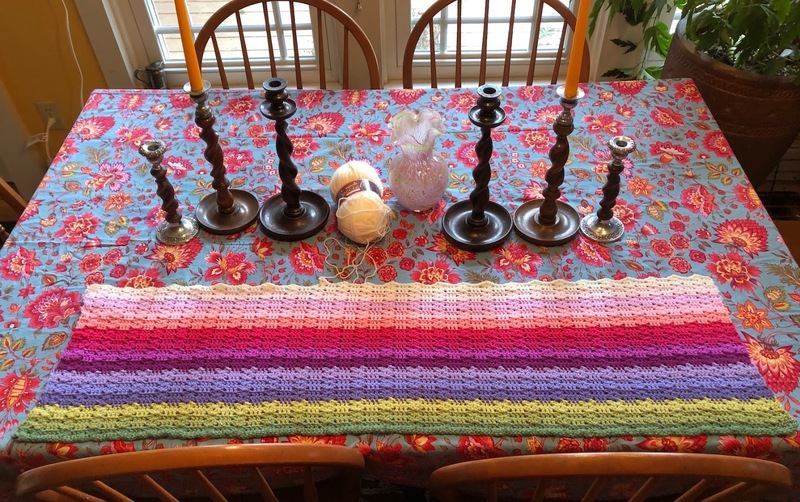 I'm on "Team Rogue" - which is we're using Lucy's yarn colors and pattern but putting the colors in our own rows. 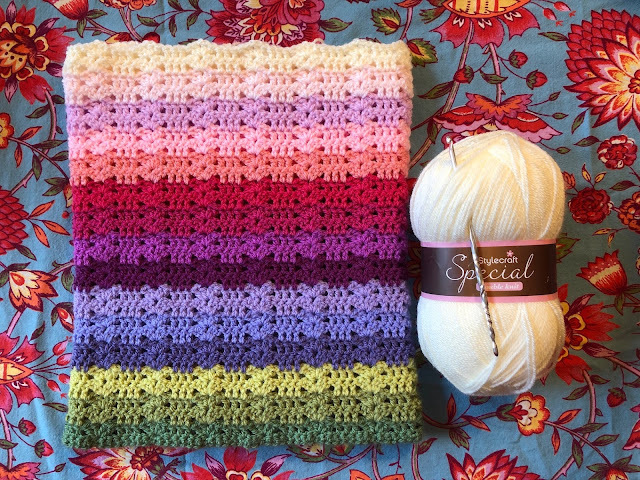 On my next rows I will remove the dark purple and put the lavender which is 3rd down to where the dark one is. I cannot say enough good things about the Stylecraft Special double knit (DK). 15 big skeins/balls of yarn for $41.05 - and that includes $12.79 s&h! These are 100 grams, too. AND.. I have not found even one knot/join in these as yet. It is acrylic so it's durable as a blanket. Soft, too. Here it is laid out flat, this will make a very nice sized blanket when done. I look forward to many happy hours working on this draped over my lap by the fire. But I will have to leave it and go swimming soon. It's cold and grey out and the wind has been howling. I do not want to go out in it and jump into a pool of cool water.. but.. I will. Yes, I will. Wah! Have a super day!! That is so pretty! I like your pattern of colors. I am waiting for my yarn to come. I can't wait to start it. Such a beautiful pattern and colors, too. You are so talented! Looking at your creations brings me joy! You've done so much on this. It is beautiful. The wind is howling here too! I seriously love that blanket and that is a great price for the yarn. I like the color sequence you’ve chosen too. Hope swimming was fun. We had freezing rain all day long so I haven’t left the house. The stitch pattern is pretty too. That will make such a joyful blanket on a grey day. Beautiful blanket and thanks for mentioning the kind of yard. I really like the lightness of it. This is such a beautiful stitch and I just love the colors! So beautiful! 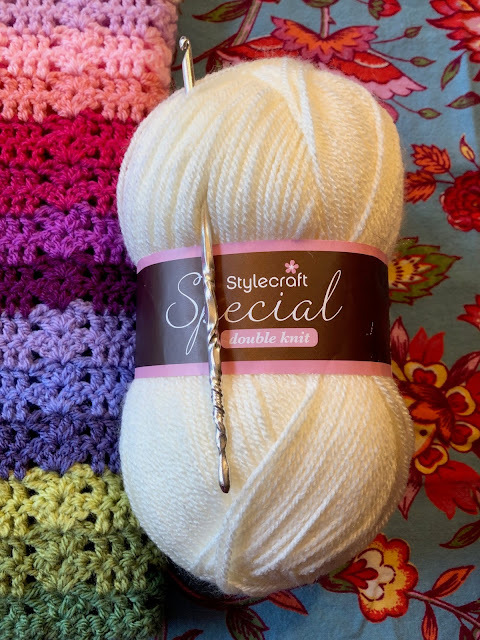 I love this yarn pack so much and I can't wait to get my hands on one! ooh this is so pretty....love the colors, needing colors here it is winter, shades of gray and white. 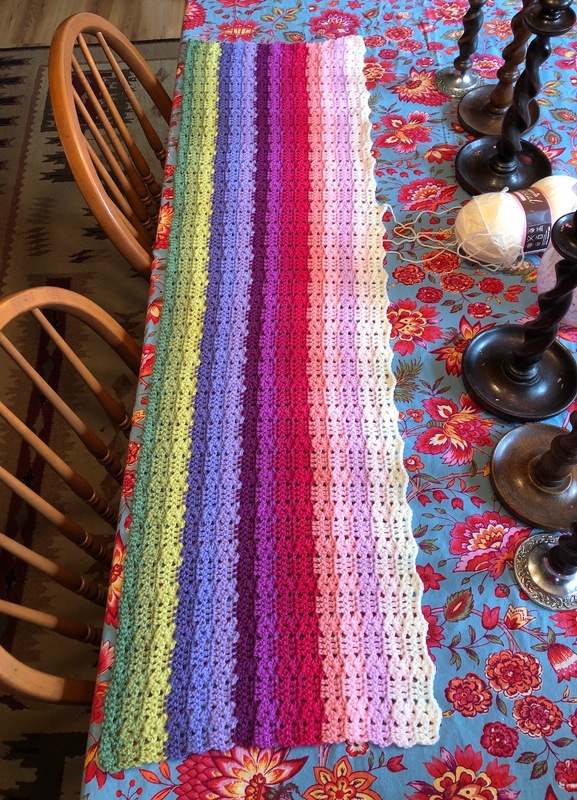 I love the beautiful bright colours on your crochet!!! So pretty. The colors are lovely! Hard to find such an array of colors here.